1: Where are Illinoisans going? Illinois is losing higher-earning residents to out-migration, and the state’s problem with wealth flight is persisting, according to data from the Internal Revenue Service. Unfortunately, research suggests the most recent state income tax hike will only worsen this trend. 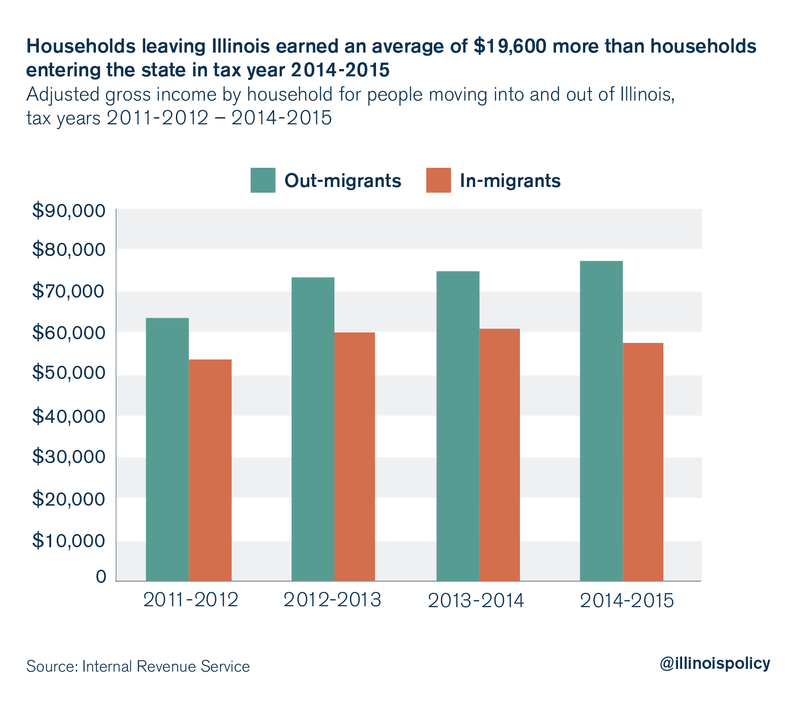 IRS migration data reveal the average income of households leaving the state exceeded the income of households coming into Illinois. Those who left Illinois earned on average $19,600 more than those who moved in. Illinois is continuing to experience significant wealth flight. 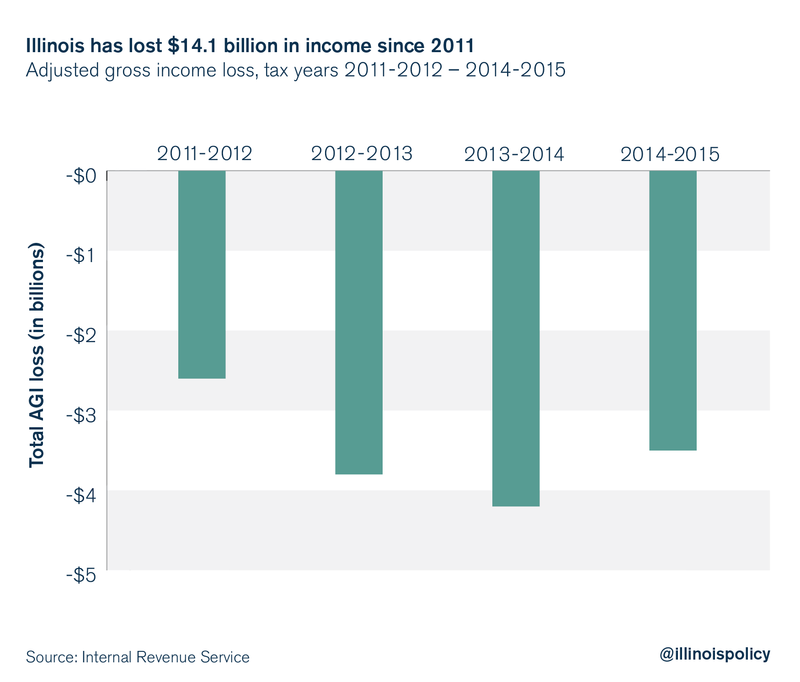 In total, Illinois lost $3.5 billion in adjusted gross income on net from spring 2014 to spring 2015. Since 2011 alone, the state has lost $14.1 billion on net due to residents packing up and shipping out. It remains to be seen what will result from the Illinois General Assembly’s recent permanent income tax hike. But research suggests it will only worsen Illinois’ wealth flight problem. Moving out of state can be costly and risky. However, when the value of moving exceeds its costs, individuals leave the state in search of a better life. 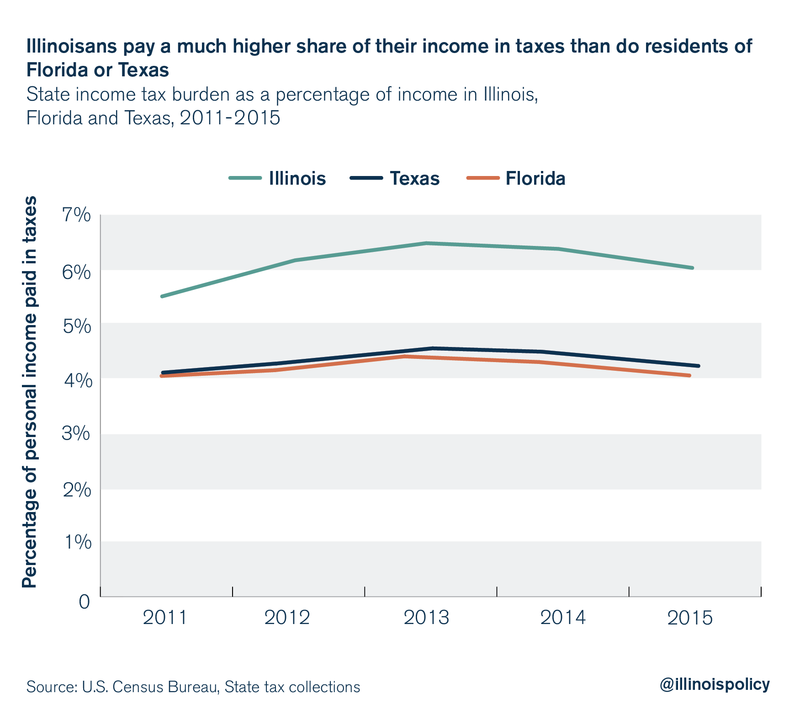 Illinois’ high tax burden raises the benefits to be gained from moving relative to staying, resulting in an exodus of families toward states with lower tax rates and more economic opportunity. A consequence of these outflows of labor and capital is that state tax revenues suffer as the tax base shrinks. This negative effect on tax collections exacerbates Illinois’ fiscal crisis. The problem in Illinois is that policymakers continue to introduce policies without taking into account the behavioral responses of individuals and businesses. In increasingly interconnected markets, the effects of policies in one state can have implications for the rest of the world. Globalization, reductions in institutional barriers to international investment and trade agreements have contributed to increased levels of worker and capital mobility across the U.S. and countries with large differences in tax climate. In the last 20 years, 57 corporations left the U.S. for more tax-friendly jurisdictions, according to Bloomberg, taking with them jobs and billions of dollars. According to the IRS migration data, Illinois’ income loss to foreign countries due to the movement of workers was $88 million from 2014-2015. However, Illinois lost a much larger share – $3.4 billion – to other states. The Fraser Institute publishes an index that ranks economic freedom among the states. The rankings compare states based on the ability of individuals to prosper, free of government restrictions and a heavy tax burden. In 2014 and 2015, the top two destinations were Texas and Florida for Illinoisans who earn higher than average income. Not surprisingly, Florida and Texas rank No. 2 and No. 3, respectively, for economic freedom in the U.S., compared with Illinois’ 32nd place ranking on the Economic Freedom of North America Index. A significant body of research finds policies that promote economic freedom have a positive effect on economic growth. Economic freedom is positively correlated with desirable outcomes such as high per capita income, economic growth and greater life expectancy (see, Barro, 1996; De Haan and Sturm, 2000; Farr et al, 1998; Gwartney and Lawson, 2003; Heckelman, 2000; Heckelman and Stroup 2000; and Torstensson, 1994). Government spending, property rights, labor market regulations and the overall tax burden – measured as the share of income paid in taxes – have often been used as indicators of economic freedom. Many of the linkages are straightforward. For example, an increase in the share of income paid in taxes burdens households and businesses, thus reducing investment and employment prospects. Dawson (2002) provides empirical evidence that economic freedom has a positive causal impact on investment. Higher income taxes, no matter how small the increase, can have lasting negative effects on the state economy. This is because tax policy influences saving and investment decisions, which in turn affect labor market outcomes – employment, wages and aggregate welfare. The IRS data on migration flows confirm that high earners prefer to live in less regulated, low-tax states. These individuals in turn cause these states to grow faster than other U.S. states. Illinois’ outflow of high earners poses an existential threat to the state’s economic future, as well as state and local government coffers. 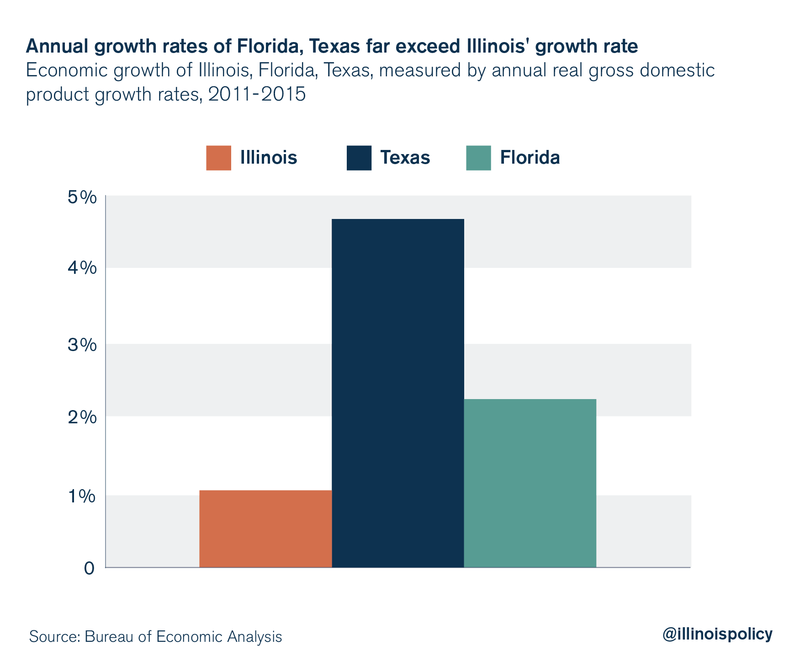 Policymakers interested in addressing this problem would be wise to look to the fastest-growing states for pro-growth policy reforms such as reducing the tax burden. Barro, Robert. 1996. “Democracy and Economic Growth.” Journal of Economic Growth 1: 1-27. Dawson, John W. 2002. “Causality in the Freedom-Growth Relationship.” European Journal of Political Economy 19: 479-495. De Haan, Jakob and Jan-Egbert Sturm. 2000. “On the Relationship Between Economic Freedom and Economic Growth.” European Journal of Political Economy 16, no. 2: 215-241. Farr, W. Kenn, Richard A. Lord, and J. Larry Wolfenbarger. 1998. “Economic Freedom, Political Freedom, and Economic Well-Being: A Causality Analysis.” Cato Journal 18, no. 2: 247-262. Gwartney, James and Robert Lawson. 2003. “The Concept and Measurement of Economic Freedom.” European Journal of Political Economy 19: 405-430. Heckelman, Jac C. 2000. “Economic Freedom and Economic Growth: A Short-Run Causal Investigation.” Journal of Applied Economics 3, no. 1: 71-91. Heckelman, Jac C. and Michael D. Stroup. 2000. “Which Economic Freedoms Contribute to Growth?” Kyklos 53, no. 4: 527-544. Torstensson, Johan. 1994. “Property Rights and Economic Growth: An Empirical Study.” Kyklos 47, no. 2: 231-247.